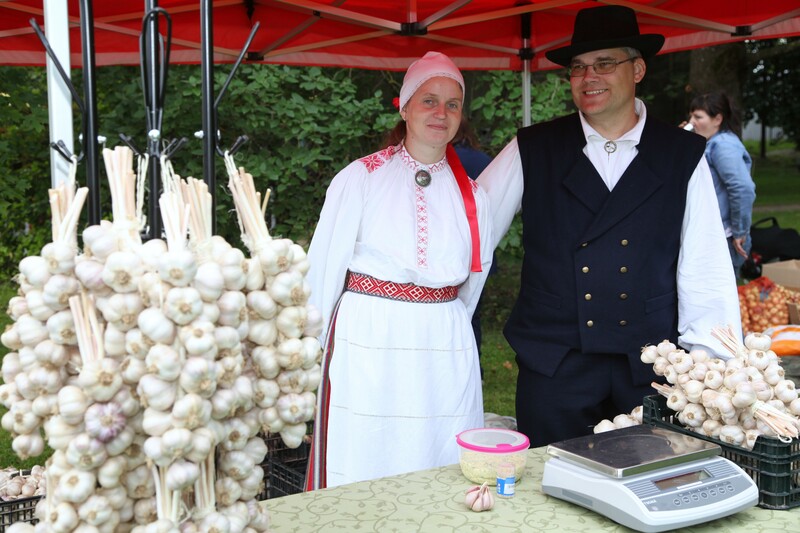 The Garlic Festival is a place for Estonian garlic growers to come together, compare the varieties and harvest, exchange the experiences. The growers take with them the garlic harvest, collected from their fields. 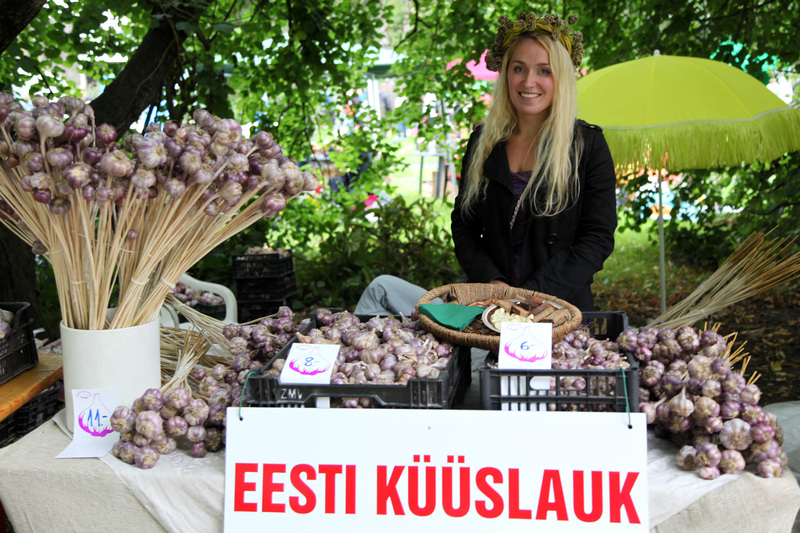 At the same time there are more than 15 tons of garlic from Estonian fields for sale. 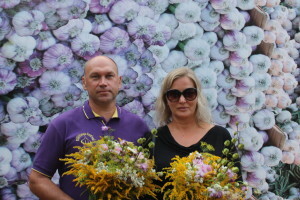 Every year there is also a competition „The biggest Garlic of Estonia“, where among the bigger garlic growers all the visitors and Estonian farmers are expected to bring their biggest garlics. The winner is found out through measuring the cross diametre of the garlics. 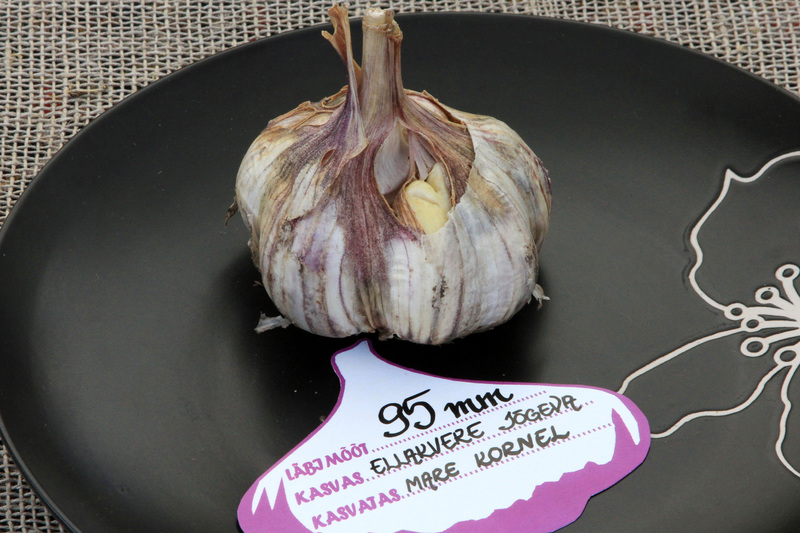 During the previous festivals the biggest garlic so far has been grown in 2012 on the field of Mare Kornel from Ellakvere, Jõgeva county.The diameter of the winner was 95 mm. 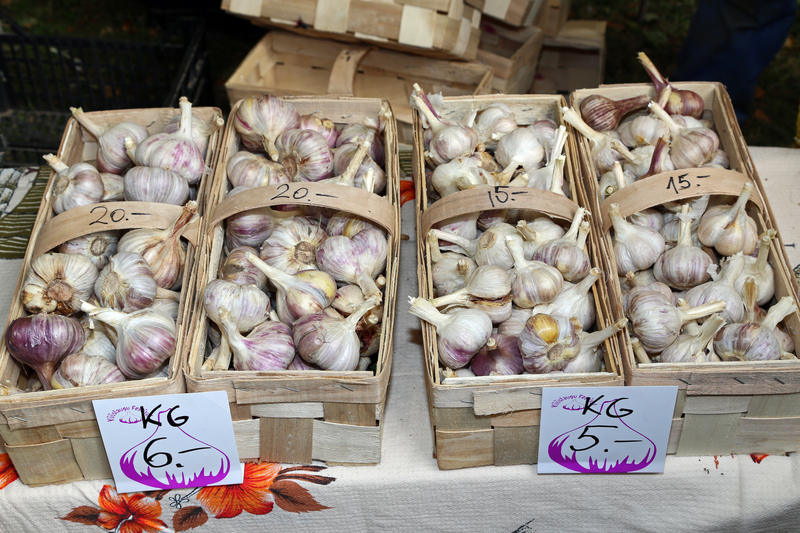 The garlic growers bring along also the seeds of new varieties and different products, made of garlic. One can find peeled garlic, marinated garlic, fermented garlic and garlic sprouts, dried garlic chips, garlic powder, garlic jam and garlic crisps on stalls. 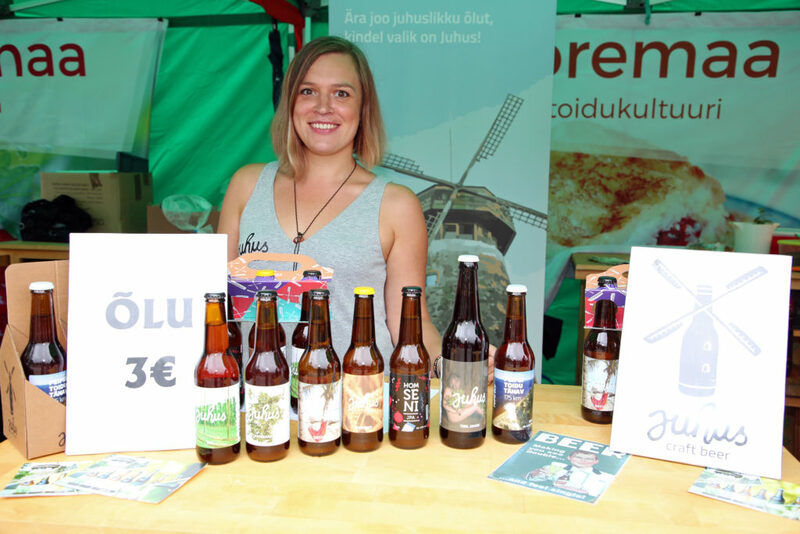 During the seven years of the Festival, Estonian food handlers and small-scale producers have always come up with something new. While in 2008 there were only a bit dirty garlic boxes on the stalls, then today the picture has changed cardinally. One can buy garlic in braids, wreaths, sheaves and also just measured in kilos. Unlike onios the garlic braids do not stay so fresh on the kitchen walls, but they offer a lot of beauty for the eye. The best temperature for preserving the garlic is 3 degrees above zero. 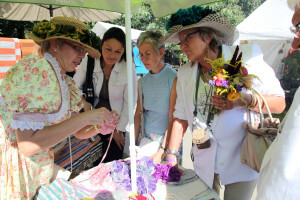 One of the very popular articles at the Festival is organic garlic. The buyers might find the price of local garlic high, but if you consider all the work from obtaining the seed till drying the garlic, the price is even low. One can always prefer buying cheap radiated Chinese garlic- has someone seen the Chinese garlic so-called blooming on the stalls? 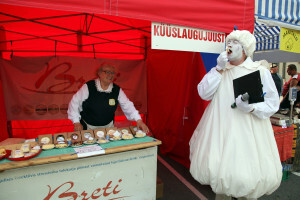 As for today one can taste and buy from the Garlic Festival products like garlic bread, garlic bacon, garlic cheese, garlic honey, garlic coffee, garlic beer, garlic vodka, garlic bagels, garlic ham, garlic sausage, garlic candies, garlic cotton candy and as favourite for children- garlic ice cream. The products are nicely packaged and there is already some competition among some products. 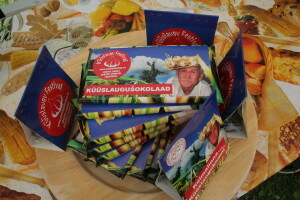 The Festival`s souvenir- Garlic Chocolate- has been produced by the company Kõlleste Kommimeistrid from the year 2009. This special product has been bought by visitors to take as gift abroad, where they have caused a lot of exitement. An exhibition of different garlic varieties grown on Estonian experimental fields is open for those interested. The world´s biggest variety Elephant Garlic has been for exhibit, too. It grows up to six times as big as we are used to see. The exhibition is always accompanied by lectures for garlic producers by lecturer Priit Põldma from the University of Life Sciences. The lectures have covered different themes connected to large-scale production. In addition to garlic one can buy from the market everything grown or made in Estonia. You can not find any foreign products, but surely home-made preserves, handicraft, vegetables and greens, forging, cosmetics, clothes, souvenirs, woodwork and food as with garlic as without. 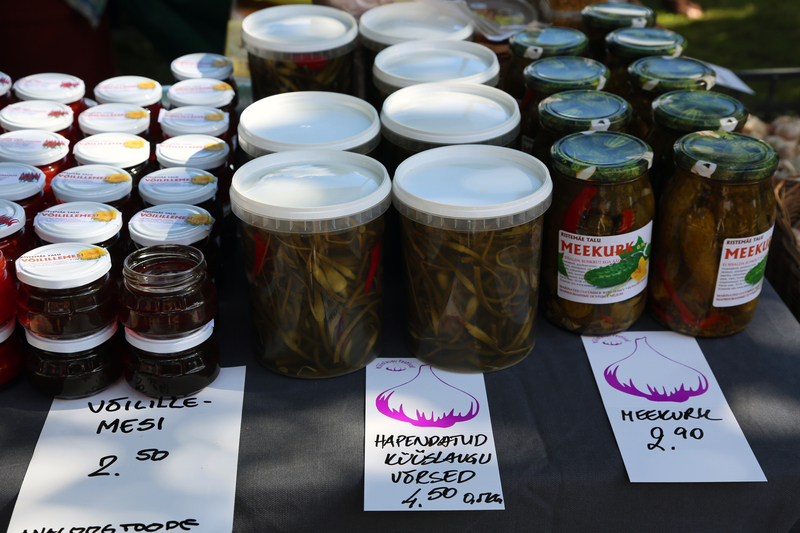 So you can find from the Festival market golden onion grown on the shores of lake Peipus, freshly smoked bream ,as handicraft pottery from the island of Muhu. Craftsmen have been very creative- one can fnd garlic-shaped earrings, bowls, gums, cutting boards and towels decorated with painted garlics, etc. 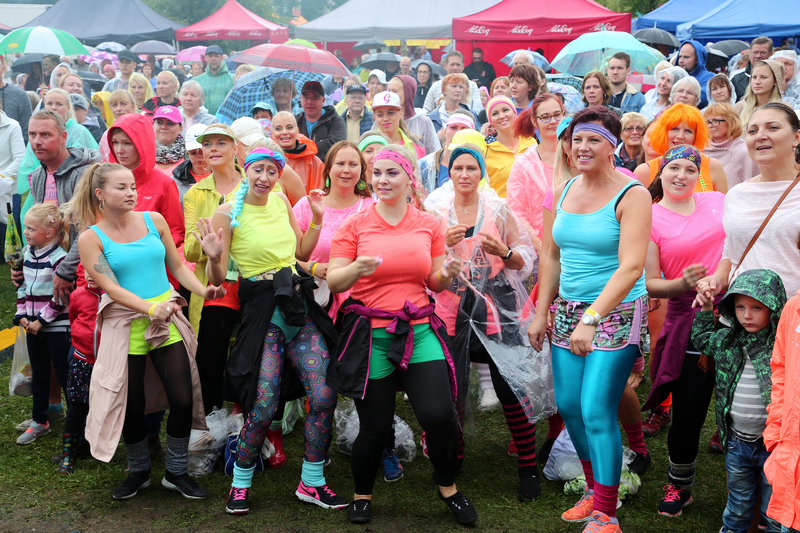 In honour of the big Festival the sellers themselves have dressed accordingly and at the end of the day the title of „The most beautiful seller“ is given out by the organiser. 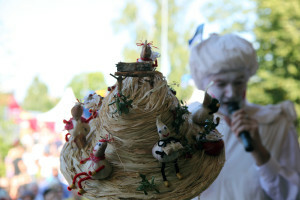 Topical competitions and the daily programme is conducted by Mr Garlic personally, wearing a lime-white garlic costume and the Estonian flag waving proudly on the hat. 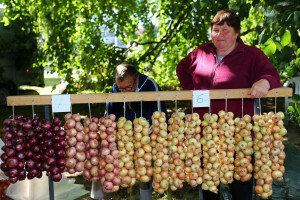 One can participate in competitions from holding a garland of garlic till eating garlic. As atradition there is also a contest called „The Nicest Garlic Hat“, where the hat must be presented to the spectators on your own head. For the first time the contest was won by a male contestant in 2012. Musically the festival programme is illustrated by the most famous Estonian country and folk musicians. 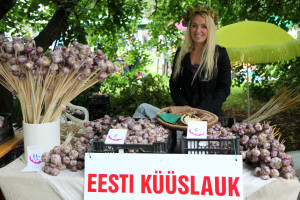 In 2012 for the first time the best garlic cook was awarded in cooperation with Estonian Culinary Institute. The award was won by the chef of restaurant Clazz Emmanuel Wille from Tallinn. 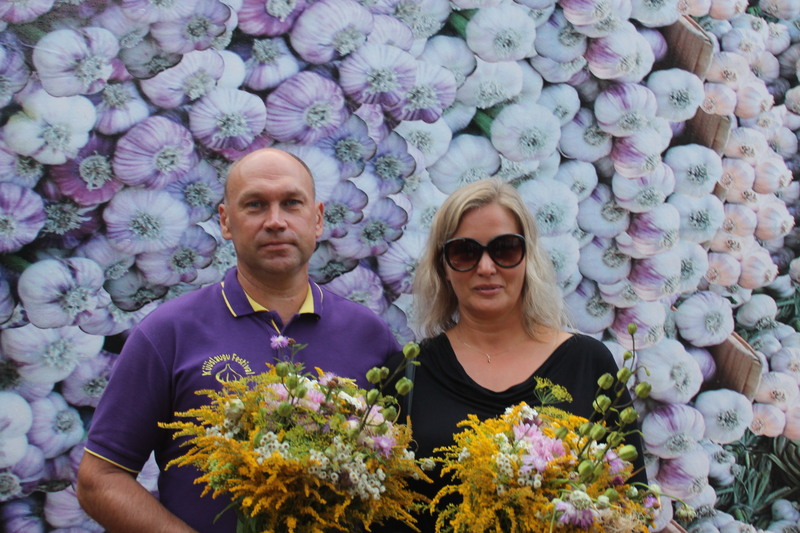 The second prize went to Sergei Trunov, the chef of garlic restaurant Balthasar, situated in the centre of Old Tallinn, former house of town hall pharmacy. 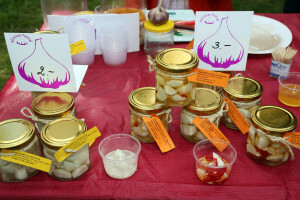 From the year of 2010 there has been held a „Garlic Tennis Tournament“ in cooperation with tennis club Artemis. 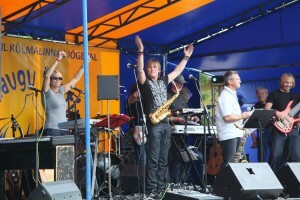 The organiser of the tournament is Kalmer Lain. 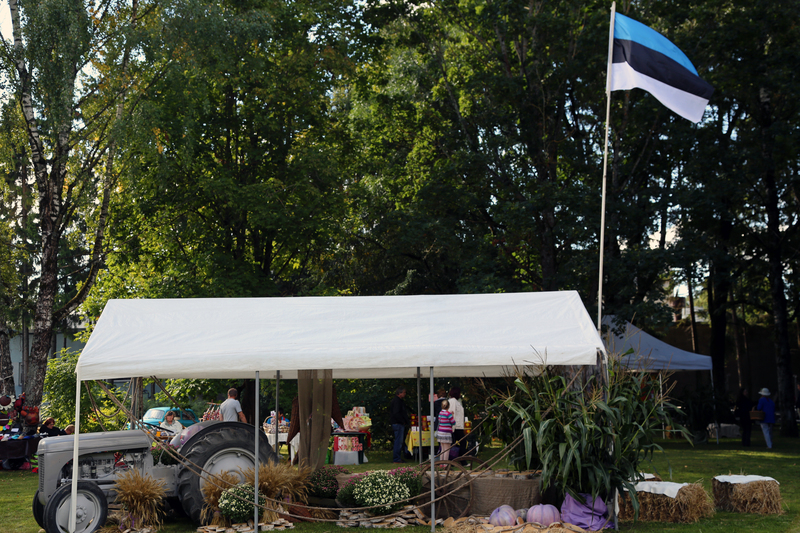 The contestants have come from Võru, Haapsalu, Jõgeva and also Tartu county. The stage of the Festival has had a different design every year and worth perpetuating. 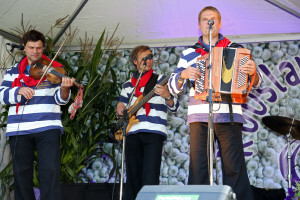 When the main performer of the Festival was Väikeste Lõõtspillide Ühing and Marko Matvere, in front of the stage big sailing boats were made, full of garlics. 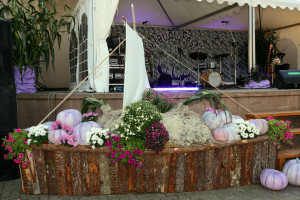 As the real garlics are too small to see from far, the florist of the Festival Ege Zukov has painted false garlics, using 500 kilos of pumpkins, painted in silvery-purple stripes. 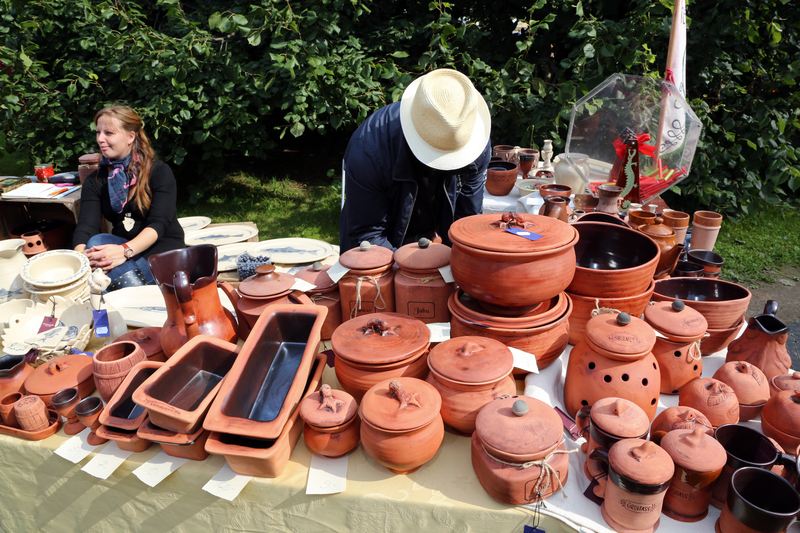 As the Garlic Festival is visited by whole families, the big part of the Festival territory is designed for children. They eagerly play on oat straw packs of „oat trampoline“, do crafts in different workshops and a day seems always too short for them. And of course- the family area always contains domestic animals- horses, goats, rabbits, fowls, ducks, geese, sheep, piglets and a donkey. The favourites for children are puppets and kittens. As taking pictures is very simple nowadays, then we have also photo corners on the Festival area, where one can stage a country-style photo of the whole family. The mothers have been taught to weave plaits for themselves and their daughters and the plaits have been tried to weave also from garlic. 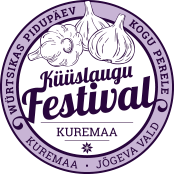 Welcome to the Garlic Festival on the 19th of August 2019 at Kuremaa, Jõgeva county ! The fresh garlic smells the most, if processed in any way the odor components are transformed- boiling, in water, milk, broth for example, removes the smell of garlic and dried garlic is almost odorless, but the smell is activated when adding water to it. It is not just in but also useful to have garlands of garlic hung in kitchens or grown on window sills. The growing garlic allocates phytoncides and as onion, it should be grown not only in kitchens, but also in bedrooms, where we also spend a big part of our lives. By the way, all kind of smells of paint, tobacco and dampness can be removed with the help of garlic and onion- you should just leave them cut open in different places and in some hours you can throw the „worked out“ material away. Small amounts of fresh, dried or heated garlic is used as seasoning. If heated for a longer time, garlic loses its piquant taste and it can even become unpleasant. This is why we add it into hot meals freshly grated, pressed or minced just before serving. Fresh garlic is also used in vegetabele salads (before that we stir the dressing in) and cold dressings. In green and fruit salads we cut the clove into half and rub the bowl with it- a bit of garlic odor makes the salad more piquant. When using garlic, we can do with much less salt. The grated garlic can be added to food fried in oil, but then it loses its specific odor and healing properties. The strong odor of garlic can be reduced by drinking warm milk, mixing it with sour cream, chewing coffe beans, lemon or parsley. It aslo helps if you eat garlic before having a meal. If eating garlic for its healing properties- eat it fresh. In that case it is advised to have it with yoghurts, curd, cheese mixes, mixed with butter, etc. Onion is most liked by French and Russians, garlic by Spaniards and Asian nations.